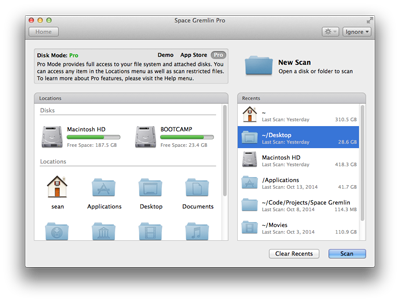 Space Gremlin is the best app to clean up space on your Mac. Space Gremlin 2.0 has finally arrived! 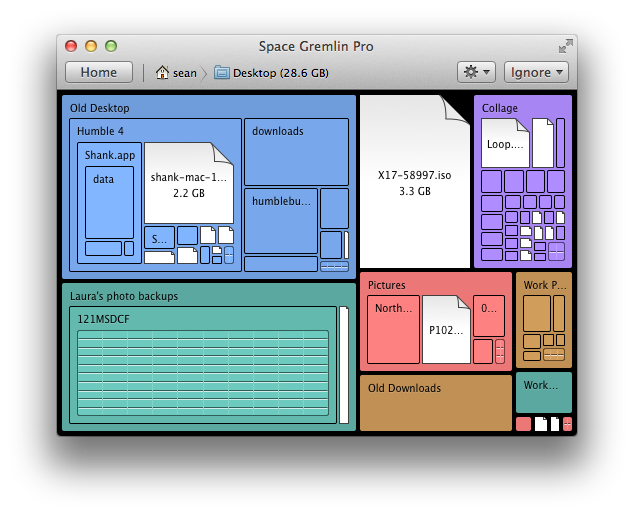 More features have been added to make Space Gremlin the most powerful tool for visualizing and cleaning up your drive in OS X. 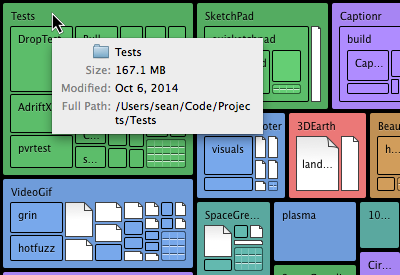 Try it out now to see how much space you could clean up on your Mac. Only $4.99 on the Mac App Store. Built for Mac OS X 10.6 and higher. Exclusive to the new Mac App Store. "I deleted over 18 gigs in 10 minutes with this tool - THANK YOU!" "This app has really helped me clean up my hard drive"
"My MacBook Air now has more space to load music." Quick Launch takes you where you need to go fast! From the instant you open Space Gremlin you'll have access to all your hard drive volumes and external drives ready to scan. If you prefer you can also limit your search to popular places within your home directory. Clicking a folder takes you in to our finely tuned scanner that beats all the competition. Clean and brilliant visuals provide you with quick feedback. A lot of time and care went in to making sure Space Gremlin could provide the most meaningful information in the most visually edible way. Folders and files have sleek and distinct looks that help you navigate your filesystem. Tooltips provide instant information so you can make instant decisions. The less time you need to spend inside Space Gremlin, the better we've done our job. Smart tools help you make the best decisions with your files. 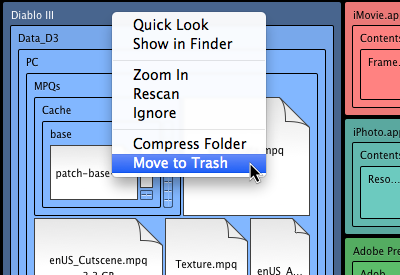 You can slice and dice your view to target the best files to either save or throw in the trash. Double-click a folder to zoom in for a better look. Ignore those files you just aren't ready to part with. When you've found a gremlin that needs to be cleaned up, you have the option to compress or move to trash. Safely empty your trash and come back to Space Gremlin to get an updated look. You even have the option to toggle hidden files that don't normally appear in Finder. Space Gremlin uses a sophisticated algorithm called squarified treemaps to use the most of your screen real estate. Nothing is more important to us than effective visualization of data. The scanning engine used to analyze your hard drive is constantly tweaked to get the best performance with the lowest memory footprint. New features are continually being refined and sent out to users. 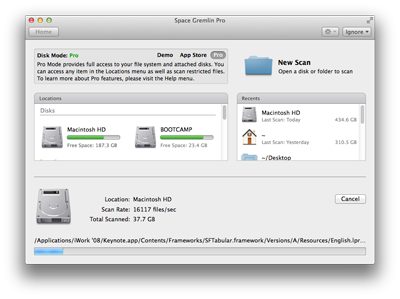 Space Gremlin is the best utility you can own to manage file usage on your hard drive. Analyzing disk space is fast and informative. By having a large perspective on your disk usage you can quickly free up several gigs of space being eaten up by those nasty gremlins. Buy now exclusively on the new Mac App store.